We’d love your help. Let us know what’s wrong with this preview of Rebel Magisters by Shanna Swendson. Tea, Love ... and Revolution! The Rebel Mechanics aren’t the only group plotting revolution against the magical British Empire. There are rebel magisters, as well, and Verity Newton and her magister employer, Lord Henry, know that the only way for the revolution to succeed is if both groups work together. A diplomatic mission seems like the perfect opportunity for them to m Tea, Love ... and Revolution! The Rebel Mechanics aren’t the only group plotting revolution against the magical British Empire. There are rebel magisters, as well, and Verity Newton and her magister employer, Lord Henry, know that the only way for the revolution to succeed is if both groups work together. A diplomatic mission seems like the perfect opportunity for them to meet with rebels in other colonies and gather support—right under the governor’s nose. To ask other readers questions about Rebel Magisters, please sign up. Is there a way I can read this book for free (like a .pdf)? It's not in my public library. No seriously. I'm cool. I'm fine. What a great second story in this series. I love the characters. All roads lead to rebellion and who doesn't love that. A nice mix of steampunk and magic with some romance on the side. I didn't want the book to end. Can't wait for the next book. Fantastic second book in this series! It's smart, fun and swoon worthy! The alternate history with magic is such a fun setting to this fast paced exciting story! I loved it and can't wait for book 3! I've devoured these books! Before I get into the whole reviewing business, I want to exhort you guys to give this series a try. I’ve been reading Shanna Swendson since I was a teen, and she excels at magical plots, romance, cuteness, and surprising levels of intensity (surprising because of how cute her books are). I reread Rebel Mechanics before launching into Rebel Magisters, and it was every bit as absurdly delightful as on my first read. Rebel Magisters may be a self-published sequel, but it loses absolutely no quality from its Macmillan days. 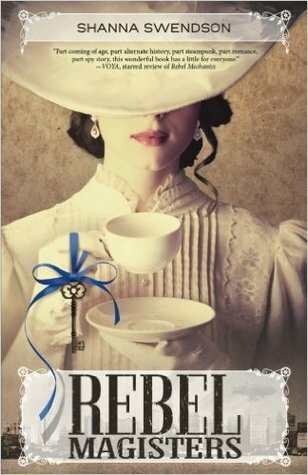 The Rebel Mechanics series is a must read. Swendson does such awesome plot things in Rebel Magisters. For those who don’t know, this series takes place in a steampunk, fantasy alternate history Colonial America. The short version is that the upper class, the Magisters, have magic and the poor folks don’t, leading to stringent rules about fraternizing between classes (basically, don’t) and changing your station (lol never). Most modern conveniences of the time are powered by magic and are far too expensive for poor people to use. Rebel mechanics (*gestures fiercely at book one and series title*) are working to develop technological solutions to what magic does for the wealthy. Tensions are increasingly anti-mother-England in the Colonies. This concludes your world building overview. Our heroine Verity Newton rules. She’s such a queen, and I love her dearly. One thing I love a lot about Verity’s character is her evolution from the start of the series. Despite her vast and abnormal education (she basically got a Yale education as a wee child), she holds to the ideas of the day and had never done much questioning of the social order or government until she arrived in New York. She doesn’t go immediately from good girl to rebel leader. She slowly gets sucked in and won over to the cause. Verity, however, also proves to be a natural leader. She doesn’t just join in with the rebel movement; she revolutionizes it (do not pardon the pun). See, she doesn’t love a lot of what the Mechanics were doing for their cause AND she knows that some Magisters can be awesome (*turns heart eyes of Lord Henry*). Basically, we all need to be Verity right now and become the change that we want to see in the world. She’s the sort of person who will step in and fight an injustice on the street and also who will become a reporter for an unsanctioned newspaper. Some time has passed between the ending of Rebel Mechanics and the start of Rebel Magisters. Not a huge amount of time, but enough that Verity has made more friends and connections and built herself a network of lady spies. What’s completely boss about this book is how ladies are dominating left and right. The reason Verity and her network can do so much is that they are constantly overlooked. Also, I love love love that the rebel groups count several people of color in their members, including a black female scientist who makes a boss and super useful invention. Swendson incorporates actual historical events into the plot of Rebel Magisters, while obviously putting a spin on them. The Boston Tea Party totally happens, only, you know, with magic and machines. The novel does have a bit less cohesion to the overall plot with Henry and Verity traveling around to foment revolution and find allies under the cover of a trip with the Governor, but it’s all very important time spent to help grow the movement. A lot of character introductions come quickly there, but this time will be very well spent in the end. The scene stealer of the book’s totally Flora. I knew in the first book that there was no way that Flora would just be the grumpy, empty-headed, judgmental girl for the whole series, and indeed I was right. Flora and Colin’s instalove on one another, despite their prejudices against each other’s classes is so funny and adorable. I’m very much keen to watch this side ship develop. And oh man what I wouldn’t give for a novella from Flora’s point of view just sayinggggggg. Not quite as good as the first, but still good. It took me a while because I couldn't remember book 1 to save my life. But once things started coming back to me it was an OK read. It was fast paced and had a very innocent G rated romance. The steam punk and alternative magic history was fun to read and explore. At times it did seem to focus on some dull, mundane aspects of life bUT better than the first book. It does end in a bit of a cliffhanger so I hope book 3 comes out. Flora, oldest girl, was surprising in this book and really stepped up a It took me a while because I couldn't remember book 1 to save my life. But once things started coming back to me it was an OK read. Hurrah for Rebel Magisters! This is the rousing sequel to Rebel Mechanics, one middle-schoolers all over Texas are reading this year, as it is on the 2016 Lone Star list [see http://www.txla.org/groups/lone-star ]. Rebel Mechanics is an alternate history book with the premise that the American Revolution did not occur in 1776 but happened in 1888 instead because the British, wait for it, were all magicians and had ruthlessly put down the "troubles" in 1776. By 1888, the rebels had discovered ste Hurrah for Rebel Magisters! This is the rousing sequel to Rebel Mechanics, one middle-schoolers all over Texas are reading this year, as it is on the 2016 Lone Star list [see http://www.txla.org/groups/lone-star ]. By 1888, the rebels had discovered steam [yes, that's right steampunk up to and including airships!] and had built all manners of mechanical wonders with their steam engines. Yes, the British had magic but now the rebels had their own sources of non-magical power, making the playing field more even. I enjoyed Rebel Mechanics so much that I could hardly wait until Rebel Magisters came out yesterday. Not only are the servants and colonials rebelling but some of the British magisters who call the colonies home are also secretly quite interested in throwing off the yoke of the British Empire. Our heroine is Verity Newman, who comes to New York to assume a governess position but shortly finds herself also deeply involved in the Rebel Mechanics underground network, little suspecting that her employer is a British magister with rebel leanings. If you enjoy Jane Austen, intrigue, and lots of exciting action, then I heartily recommend this series! I absolutely loved this book, the sequel to Rebel Mechanics, I felt like it was even better than the first one. Intriguing spies, love and mystery made this one hard to put down. I love the alternate history plot and the similarities of that history and ours is fun to point out and notice; and also I have a weak spot for Lord Henry the magister who wants a revolution and Verity the nanny who helps him see it. The only bad thing with this book is I want the next in the series like right now. Oh w I absolutely loved this book, the sequel to Rebel Mechanics, I felt like it was even better than the first one. Intriguing spies, love and mystery made this one hard to put down. Swendson continues her delightful series set in magical, different reality. The English Empire, with it's ruling magical class, is starting to see the American Colonies slip from their grasp. Verity, a young woman unconvinced of her own merits, is finding her way to this Revolution. With a nice mix of polite romance, enjoyable characters, and just enough world building shown rather than explained, this a clever series worth enjoying. I am glad Shanna Swendson decided to go ahead and publish this herself after the publisher for the first book in the series declined it. Verity is an appealing heroine, and I look forward to seeing where the rebellion goes next. The romance is rather a slow developing one, which may frustrate some readers, but since this is technically a YA series, it seems appropriate. So good. I'm going to need the next book ASAP! I'm happy the author self-published the second book, I really enjoyed it. I hope she's planning to write a third, because I want to know what happens next. Rebel Magisters is the sequel to Shanna Swendson's Steampunk HIstorical YA alternate reality, Rebel Mechanics. RM and it's sequel R Magisters is how she percieves the American REvolution and subsequent history would have been if the British have magic. Verity and her employer, Magister Lord Henry have already met the Rebel Mechanics and helped them escape out of the city with their machines to avoid being captured by the British Government so they can keep working towards an eventual revolution. Rebel Magisters is the sequel to Shanna Swendson's Steampunk HIstorical YA alternate reality, Rebel Mechanics. RM and it's sequel R Magisters is how she percieves the American REvolution and subsequent history would have been if the British have magic. Verity and her employer, Magister Lord Henry have already met the Rebel Mechanics and helped them escape out of the city with their machines to avoid being captured by the British Government so they can keep working towards an eventual revolution. RMagisters finds Verity and Henry beginning to entertain the idea of how can they manage a revolution that could win. They undesrstand that it would most likely need to be a combination of the Rebel Mechanics and Magisters that are more positively inclined to a revolution. All the while keeping Verity's magic hidden and any budding feelings at bay. We get to see a whole new side to quite a few of the beloved characters which is quite fun as well as meet some new characters as well who will be vital to the plot. Flora gets some much needed character growth and is set up to have even more in book 3 which is delightful. Another surpise is that we get to see other cities within the world Shanna has created and how some of their magisters see the world. It's setting up to be quite the revolution if it pans out properly. More information, some spying, flying and some characters surprise you, and then we get a sweet-slow romance. Very satisfying! I was an immediate fan of Rebel Mechanics when I read it last year. When it ended, I was a little sad that it was a standalone so imagine my surprise when I saw a fellow blogger add Rebel Magisters on Goodreads! Much like Rebel Mechanics , this follow-up is fast-paced and entertaining. Verity continues to assist the Mechanics and Henry in starting a revolution against the high-ranking Magisters, only now she becomes a liaison between the Rebel Mechanics and a few choice Magisters who no long I was an immediate fan of Rebel Mechanics when I read it last year. When it ended, I was a little sad that it was a standalone so imagine my surprise when I saw a fellow blogger add Rebel Magisters on Goodreads! Much like Rebel Mechanics , this follow-up is fast-paced and entertaining. Verity continues to assist the Mechanics and Henry in starting a revolution against the high-ranking Magisters, only now she becomes a liaison between the Rebel Mechanics and a few choice Magisters who no longer support the British throne. Verity, still distrustful of the Magisters after they tricked her into joining them, continues to assist them as she approves of their end game, but questions some of their motives and ways they accomplish some of their smaller tasks. I like that she kept her eyes and ears open around the group due to her past experiences and didn't just ignore their wrongdoings. Verity becomes a stronger contender in the upcoming revolution this time around. While Lord Henry is aware of her commitments to the Rebel Mechanics, she still has to sneak around the city delivering letters. Not to mention, the children's grandfather is The Duke of New York (aka governor of the American colonies), which adds an extra element of risk. Speaking of the children, I became such a huge fan of Flora during this novel and I can't wait to see what becomes of her character in future installments. The relationship between Verity and Lord Henry, now that their secrets are out in the open (at least between one another), is adorable. Because of their class difference, they can't express themselves as they wish to but their secret glances and meetings tell us the whole story. I'm glad Shanna went ahead with writing and publishing this second installment because while I was content with the ending of Rebel Mechanics , I craved more of this world. I will warn you that Rebel Magisters is not the end. While Shanna states she has plans to continue the series, she doesn't yet have any details. I, however, will be waiting with baited breath for the next book in this series! Good sequel- interesting parallels to actual history, especially the allusion to how the Natives were initially blamed for the tea party/used as a scapegoat due to costumes used while dumping tea. The plot was a little loose and non-coherent, though it picked up towards the end, thankfully, once the real action started. I felt slightly bored in the beginning, as almost nothing actually happened. The best sustained part of this book was the romance between Liberty? Verity? (I can't remember which one is her real name) and Henry (?). While perhaps not the most successful romance, it was certainly constant, and more realistic than most books would have portrayed it, which is saying something. Once again, no diversity outside of some stereotypical roles- maybe this is intentional? Either way, race isn't handled at all in any capacity, which is kind of bad. Rebel Magisters was a good sequel to its predecessor. The story focused on the difficult alliances between the mechanics and the magisters. On the other side, we have Verity's and Henry's upcoming romance, which I have to say was slow but believable due to the conditions they were both facing. My favourite part was the ending, because it's hinted that Verity and Henry will have a chance to be together in the next book. The ending, not a cliffhanger, but a hint enough to know what's coming. So much better than the first one. P.S. Flora was a pleasant surprise and now my fave character! While I don't think I enjoyed this book quite as much as the first book in the series, this was certainly a fun installment! Set in an alternate history where the U.S. colonies are still under British rule and those in power (the magisters) stay in power because they can use magic, this picks up where the last book left off. Verity is still working as the governess for a prominent magister family and grappling with her growing feelings for the man she works for but can't have due to their differ While I don't think I enjoyed this book quite as much as the first book in the series, this was certainly a fun installment! Set in an alternate history where the U.S. colonies are still under British rule and those in power (the magisters) stay in power because they can use magic, this picks up where the last book left off. Verity is still working as the governess for a prominent magister family and grappling with her growing feelings for the man she works for but can't have due to their different classes. The mechanics aren't the only rebels pushing for revolution; there are a growing number of magisters who are dissatisfied with the British rule and want to fight for independence, but working together to achieve this is difficult because both sides distrust the other. Verity continues to act as a spy for the rebels, trying to drum up support, while she travels around the colonies with the family employing her. This book had a number of parallels and references to actual historical events, and I thought the author was quite clever with the way she portrayed these events in this other reality! For example, the actual Boston Tea Party never happened in this book's world, but while the story unfolds, in 1888, the rebels are fed up with the British rule and consider dumping tea into the ocean as a form of protest against the taxes. I found these sorts of references quite tongue-in-cheek and clever, making it seem like these sorts of events were inevitable at some point in time. The children Verity is tasked with taking care of grew throughout this book, and there was quite a bit of focus on the kids and the slowly building romance instead of focusing solely on the rebels and their goals in here. The magic in this book was even more downplayed than the first book, which surprised me because even the first book didn't have a ton of magic in it! However, this kept the focus on the characters themselves, which was nice, as they were all quite likable. The first book in the series, Rebel Mechanics left off with the mechanics successfully escaping New York City with there machines. Great Britian believes that they have defeated the Rebel Mechanics but what they don't know is that that was just the beginning. Verity and the family she is a governess for go on with their normal lives except now that Verity's employer Henry is in on the Rebel Mechanics and since he is for their cause they Verity and him continue to meet up with some of their membe The first book in the series, Rebel Mechanics left off with the mechanics successfully escaping New York City with there machines. Great Britian believes that they have defeated the Rebel Mechanics but what they don't know is that that was just the beginning. Verity and the family she is a governess for go on with their normal lives except now that Verity's employer Henry is in on the Rebel Mechanics and since he is for their cause they Verity and him continue to meet up with some of their members. But that's not the only thing. Henry also knows that his other magister friends are for the cause of revolution to and can help the Mechanics. The Mechanics say yes to the help and are now allies with some of the magisters. As all of this is going on the Governer has planned a trip for him and Henry's family to go all around the colonies. Henry accepts the invitation because he realizes that he can communicate with other magisters and Mechanics in different places across the colonies to find out what their plans are. The trips first stop is Boston and Henry and Verity meet up with the magisters and mechanics up there to discuss their plans. In the end they end up dumping all of the tea on a ship as a protest by how high the taxes are. The trips next stop takes them to Charleston where they will overhear that the the Governor has plans to higher taxes and has them on a sheet of paper . Henry steels the sheet of paper to use as a motivator for people outraged by the taxes. See if the Rebel Mechanics and the new Rebel Magisters can come together and defeat the British in the book Rebel Magisters. This was a solidly written, engaging sequel to Rebel Mechanics. Now that Verity is more firmly entrenched in rebellion, she and Lord Henry see opportunities for the Mechanics to gain the support of disaffected Magisters and join forces, however the two groups distrust and dislike each other. Despite their shared desire to overthrow British rule, bringing the two sides together doesn't prove easy. I felt that the author did a good job of showing how fractured the Magister group really is, with the This was a solidly written, engaging sequel to Rebel Mechanics. Now that Verity is more firmly entrenched in rebellion, she and Lord Henry see opportunities for the Mechanics to gain the support of disaffected Magisters and join forces, however the two groups distrust and dislike each other. Despite their shared desire to overthrow British rule, bringing the two sides together doesn't prove easy. I felt that the author did a good job of showing how fractured the Magister group really is, with their being various driving motivations (Henry's youthful friends vs. older titled nobles). She paints a picture of how difficult an effective rebellion would be, without more support across a wider swath of social classes, and the need for money, a lot of it, if there's ever a chance for success. Rebel Magisters was better than its predecessor. There was more progress in the development of a revolution and not as many people who were trying to deceive Verity. There wasn't a love triangle in here and we get to see more of Lord Henry.😉 The kids were also a great part of the book, and I love how Flora has developed as a character. She contributed a decent amount to the story. It's amazing how many events and thoughts parallel with the real American Revolution. This made it feel as if that war was just a little "delayed"; Same cause, same goals, but different people. I'll be reading the third book next. I hope I get to see Lord Henry a decent amount after how this installment ended though. The second book in the Rebel Mechanics series picks up soon after the first book. Verity is working with both the Rebel Mechanics and the Rebel Magisters and each group wants the same changes. Verity works to bring these two groups together as a united front to work on starting a revolution. I enjoy how the book mixes some real historical events, such as the Boston Tea Party, and mixes in some steampunk elements along with espionage and a bit of romance. I really like Verity and Lord Henrys frie The second book in the Rebel Mechanics series picks up soon after the first book. Verity is working with both the Rebel Mechanics and the Rebel Magisters and each group wants the same changes. Verity works to bring these two groups together as a united front to work on starting a revolution. I enjoy how the book mixes some real historical events, such as the Boston Tea Party, and mixes in some steampunk elements along with espionage and a bit of romance. I really like Verity and Lord Henrys friendship and seeing the slow development of romance between the two. A little girl learned to amuse herself by making up stories in her head. She turned everyday activities into exciting adventures, and she made up new adventures for characters from her favorite movies, TV shows and books. Then one day she realized that if she wrote down those stories, she'd have a book! But that was crazy, she thought. Real people don't become novelists. That was like deciding you were going to be a movie star. You couldn't just go and do it. But, it turns out, you can, and she did. She realized her dream of becoming a novelist and seeing her stories in bookstores. And then she started to wig herself out by writing about herself in the third-person. As I said above in that bit of silliness, I've always been a writer at heart. My favorite way to play was to create stories and act them out with my Fisher-Price people, my Barbie dolls or myself and a box of play clothes. If none of those things were available, I could just sit and make up stories in my head. I occasionally got into trouble for being a little too creative, such as the time when I embellished a bit on my kindergarten experiences (where's the dramatic hook in coloring, cutting out and pasting?). When I was in seventh grade and a bit old for Fisher-Price people, Barbie dolls or the dress-up box, I started writing these stories down in spiral notebooks. Later, I found an old manual typewriter, taught myself to type, then wrote a lot of first chapters of novels on it. I still hadn't figured out how to actually be a working novelist who gets paid for writing (finishing a book instead of writing a lot of first chapters might have been a good start), so when it came time to go to college, I went to journalism school at the University of Texas. While getting my degree in broadcast news, I managed to structure a curriculum that might also help me in my real career plans. I took fencing (which I thought would be useful for writing fantasy novels), an astronomy course on the search for extraterrestrial life (in case I wanted to write science fiction), psychology, interpersonal communication, and parageography (the geography of imaginary lands). I got serious about pursuing my novel-writing ambitions soon after I got my first job in public relations (TV reporting, it turns out, would have taken away from my writing time) when I started joining local writing organizations and reading books on how to write a novel. Then I took the big step of registering for a writing conference. With the registration fee, you could enter two manuscripts in a contest that went with the conference. I figured if I was paying that much money, I'd get the most out of it, so I wrote two entries. At the conference, I met a real, live editor, who encouraged me to submit, and one of my entries won the science fiction/fantasy category of the contest. I hurried to finish the novel the editor had asked for, then mailed a proposal. She ended up rejecting the book, but encouraged me to keep trying. I ended up selling that novel elsewhere, then sold two more books to that publisher before I had another idea for that original editor. That book ended up selling, and then one more. And then I hit the wall. Due to a number of circumstances, some of which weren't my fault and some of which were, I didn't sell anything else for eight years. But then I had the idea that became Enchanted, Inc., I wrote it, sold it, and here I am. I think I need to get a few more hobbies or something else going on in my life that isn't related to reading or writing because currently my bio in my books is shorter than the "about the typeface" section. Yes, a typeface has a more interesting life than I do.